As you may have guessed from the very Valentine links in my fab finds post, I have nothing particular against the heart-filled holiday. To my mind, Valentine's Day is really just a celebration of chocolate and the color pink. ...and a little Disney, naturally! 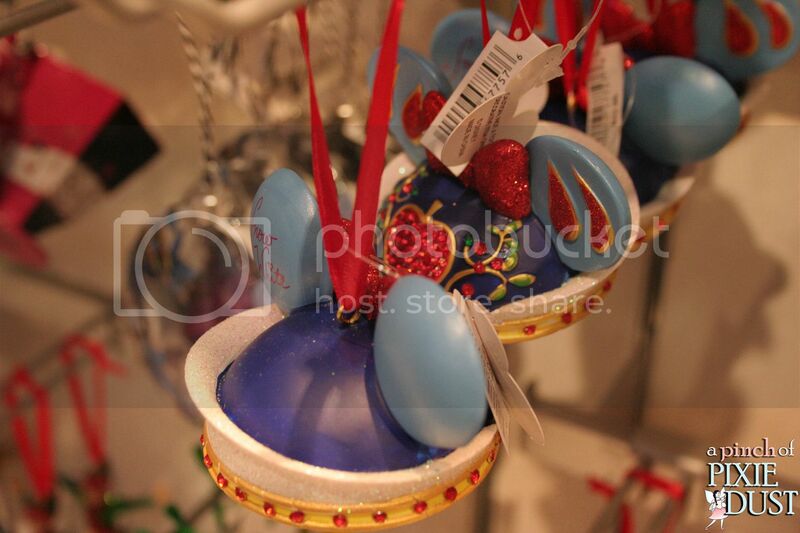 To celebrate Heart Day, I thought I'd share some pretty pics of Mickey Ear ornaments I spotted at Bay View Gifts in the Contemporary. Technically I believe these are Christmas ornaments, but I think they'd be adorable any time of year - and wouldn't the above chocolate-themed creation be the BEST Valentine's gift?? 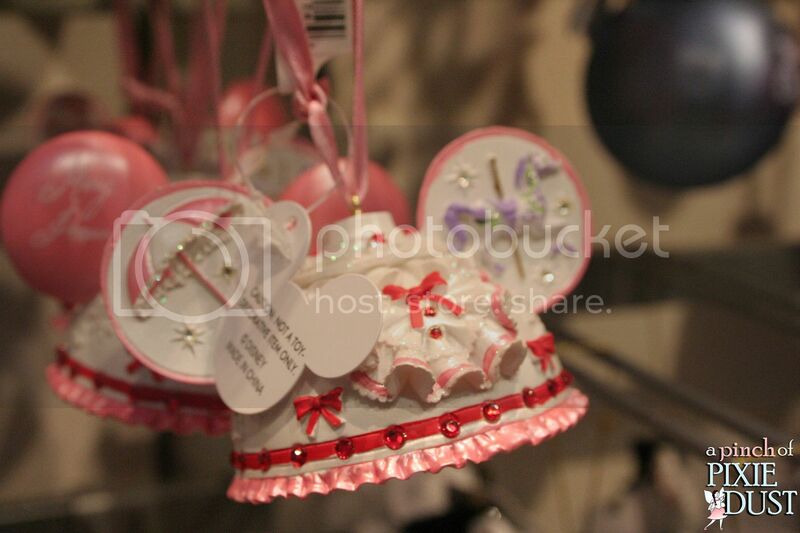 Mary Poppins has a pink and ruffly and practically perfect Mickey ear ornament too! Mary's dress would be just the thing for a Valentine's outfit, don't you think?? If Alice judges by the Queen of Hearts, she probably is not a big fan of Valentine's Day. Many of the characters and - of course - all of the princesses had an ear ornament. Princess ears are good for V Day, right? I mean, princess cupcakes are better, but ears are good too. Here was Aurora's, featuring a rose (probably a briar rose!). And I love the sparkles, one for each of Aurora's fairies! 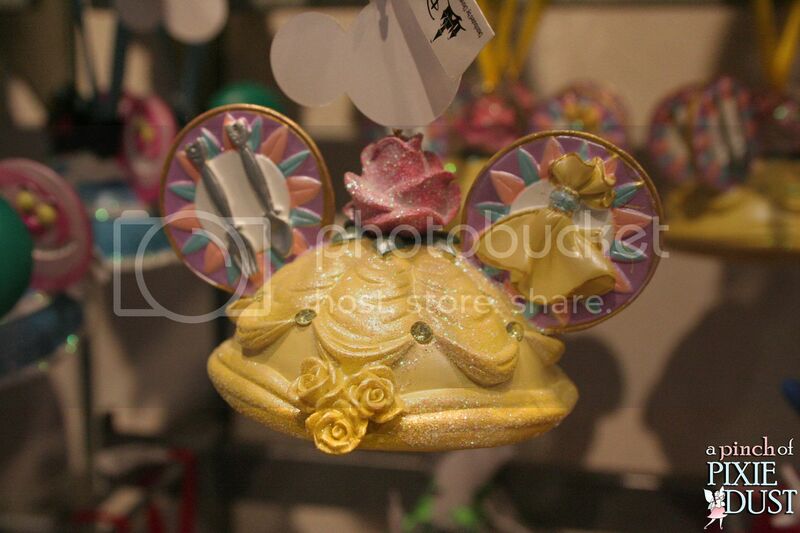 Belle's ear ornament also had a pretty pink rose - as well as dancing forks, napkins and plates. 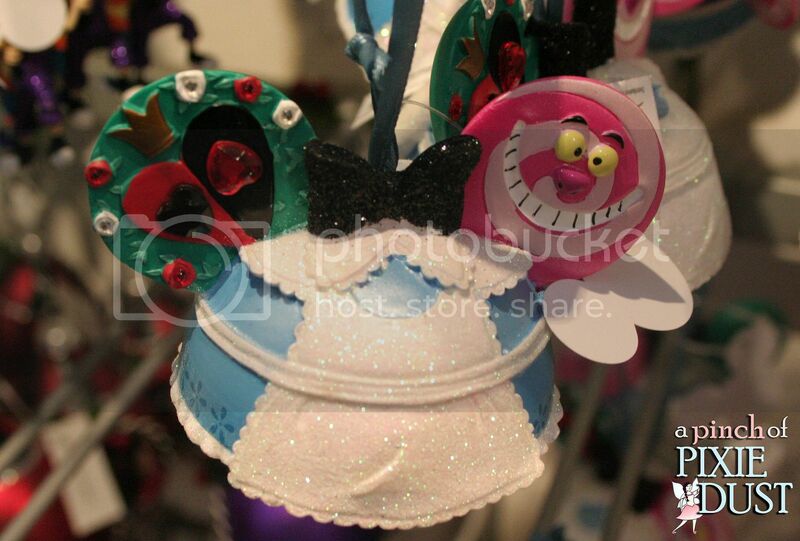 A lot of these ornaments reminded me of actual Mickey Ears that you can buy to wear. Remember these? So you can get one for your head and one for decorating your house! 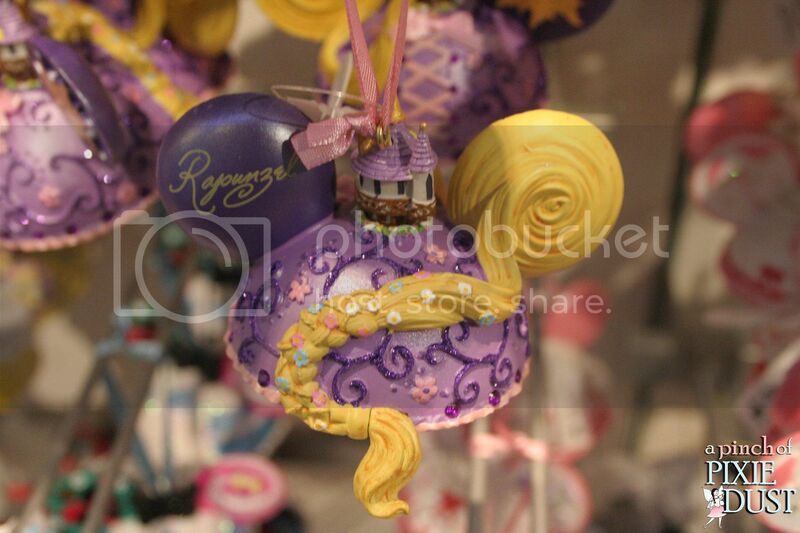 It's purple, not pink, but I LOVE Rapunzel's ears - she's got the tower AND that crazy hair! Each of the ears had the character's signature on the back. 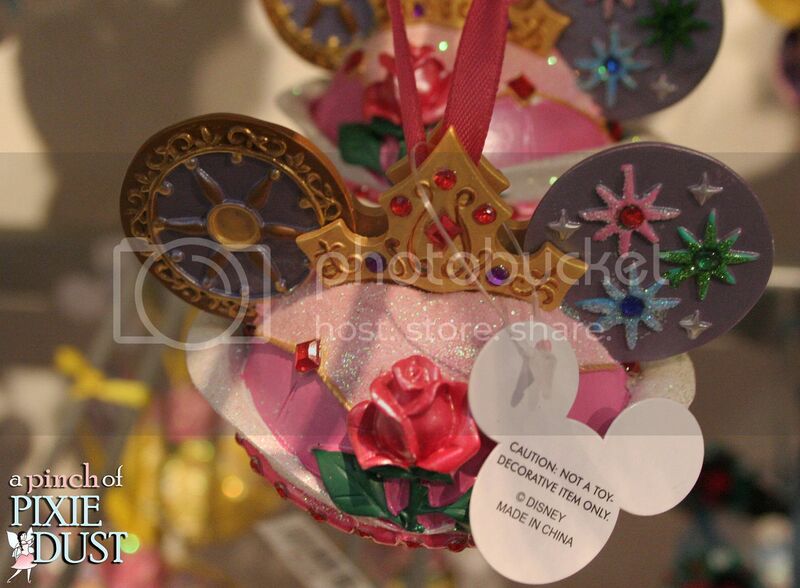 Here's Snow White's ornament - it looks just like her dress with that collar and the sleeves as ears! ...including the PRINCESS SHOES. 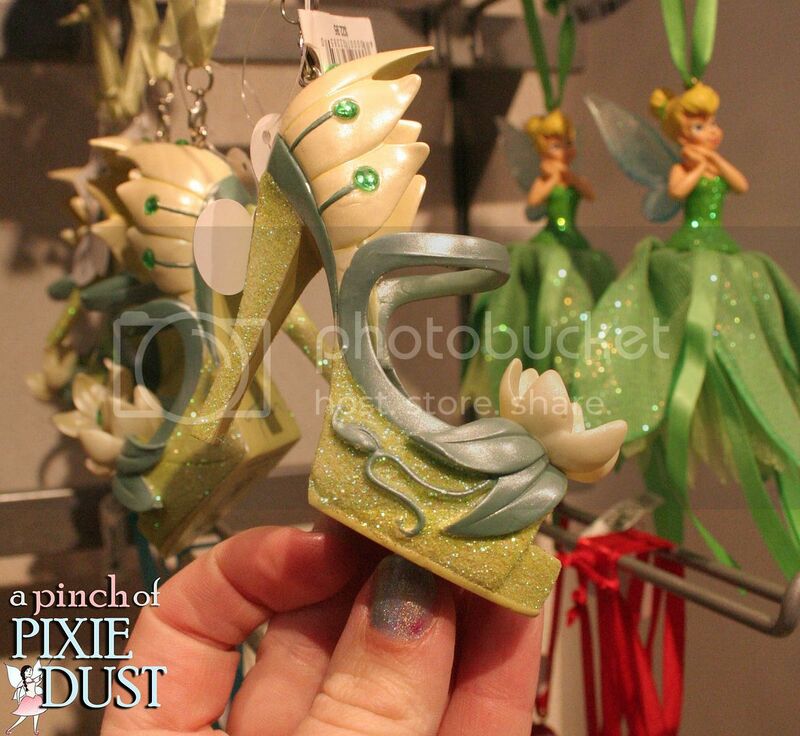 On the left is Tinkerbell's and on the right is Tiana's - LOVE IT. 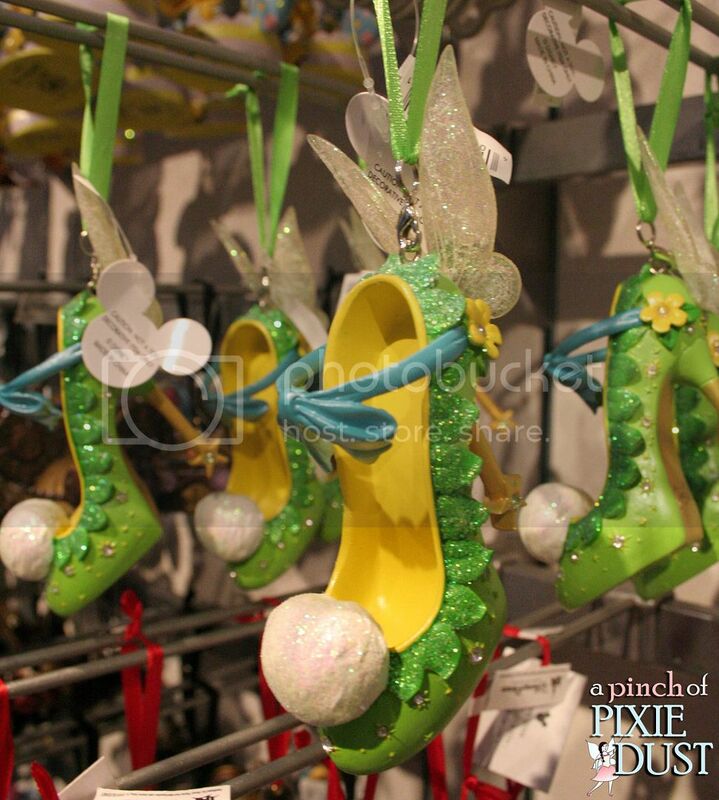 It must be so fun to dream up these pretty Disney baubles! 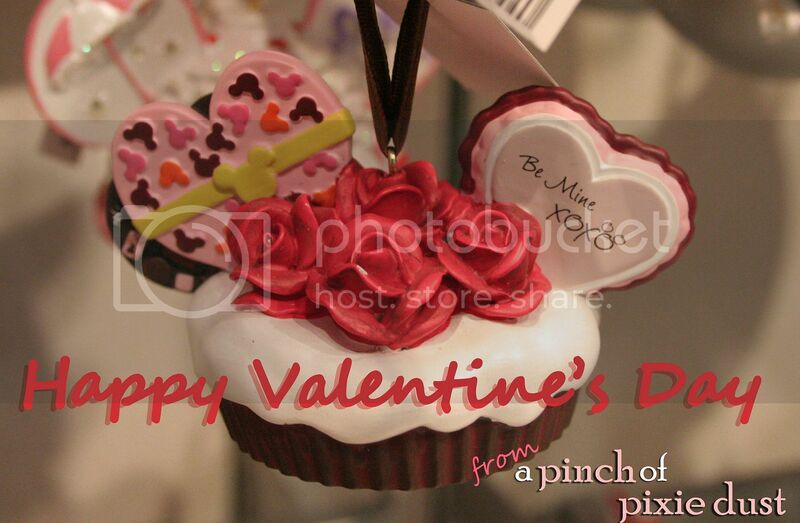 I hope everybody had a very fun Valentine's Day...filled with lots of chocolate and pink! I thought the ears were cute, but when I saw the shoes, I was blown away! I don't even own a pair of heels like that, but I think there's something so pretty about them. I took a video of the ornaments at the Christmas store at DHS because there were too many for me to take pics of all of them. I'm glad you took a lot of them! They're all so beautiful, aren't they? A video was a smart idea - there were SO many different ones!